"The October 1944 edition of Fortune magazine carried an article by a corporate executive that makes for amazing reading today. It was written by William B. Benton — a co-founder of the Benton & Bowles ad agency — and an editor’s note explained that Benton was speaking not just for himself but on behalf of a major corporate lobbying group. The article then laid out a vision for American prosperity after World War II. At the time, almost nobody took postwar prosperity for granted. The world had just endured 15 years of depression and war. Many Americans were worried that the end of wartime production, combined with the return of job-seeking soldiers, would plunge the economy into a new slump. “Today victory is our purpose,” Benton wrote. “Tomorrow our goal will be jobs, peacetime production, high living standards and opportunity.” That goal, he wrote, depended on American businesses accepting “necessary and appropriate government regulation,” as well as labor unions. It depended on companies not earning their profits “at the expense of the welfare of the community.” It depended on rising wages. The great stagnation of living standards is a defining problem of our time. Most families do not enjoy the “rapidly rising level of living” that Benton called for. Understandably, many Americans are anxious and angry. The solution will need to involve a return to higher taxes on the rich. But it’s also worth thinking about pre-tax incomes — and specifically what goes on inside corporations. It’s worth asking the question that Benton asked: What kind of corporate America does the rest of America need? Elizabeth Warren, the Massachusetts senator, is now rolling out a platform for her almost-certain presidential campaign, and it includes an answer to this question. It is a fascinating one, because it differs from the usual Democratic agenda of progressive taxes and bigger social programs (which Warren also supports). Her idea is the most intriguing policy idea to come out of the early 2020 campaign. She has proposed a bill in the Senate — and Ben Ray Luján, a top House Democrat, will soon offer it there — that would require corporate boards to take into account the interests of customers, employees and communities. To make sure that happens, 40 percent of a company’s board seats would be elected by employees. Germany uses a version of this “shared-governance” model, mostly successfully. Even in today’s hypercompetitive economy, German corporations earn nice profits with a philosophy that looks more like William Benton’s than Gordon Gekko’s. 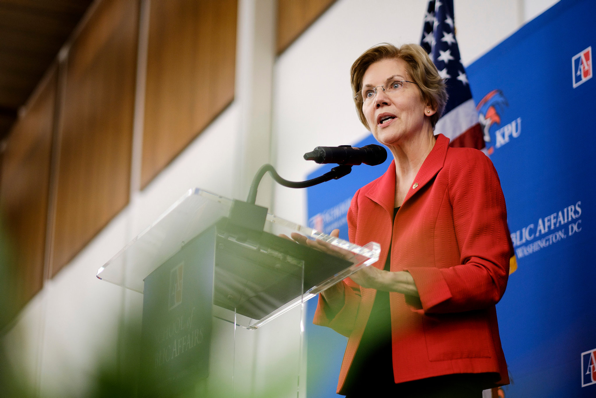 Is Warren’s plan the best way to rein in corporate greed? I’m not yet sure. I want to see politicians and experts hash out her idea and others — much as they hashed out health care policy in the 2008 campaign. But I do know this: American capitalism isn’t working right now. If Benton and his fellow postwar executives returned with the same ideas today, they would be branded as socialists. In truth, they were the capitalists who cared enough about the system to save it. The same goes for the new reformers."